Thank you to Red Heart for providing the yarn used in this project. Initial ch-2 at the beginning of each Popcorn round does not count as a stitch. The hat is slouchy. If you prefer a tighter fit, you will need to work at a tighter tension and work fewer rounds, as desired. I have seen a lot of hats made in Red Heart Ombre but the color changes so slowly that the hat looked like a solid color. I chose a popcorn for this hat to make use of as much yarn as possible so the color changes could actually be seen and it worked! Popcorn (pop): Make 4 complete dc in space indicated, lift up the loop slightly of the last dc, remove hook, insert hook in first dc, pull slightly lifted loop through, tighten slightly. Front Post Double Crochet (fpdc): Yarn over, insert hook to the side of the indicated stitch, move hook around the back of the stitch and out the other side of same stitch (hook is now in front of the work again), yarn over, pull loop through, [yarn over, pull through 2 loops on hook] twice. Rnd 1: With larger hook, ch 4, sl st to first ch to form a ring, ch 2 (doesn’t count as a stitch here and doesn’t count as a stitch in remaining rounds), [pop, ch 2] 6 times, sl st to first pop: 6 pop, separated by 2 ch each. Rnd 2: Sl st in ch-2 sp, ch-2, [pop, ch 2, pop, ch 2] in each ch-2 sp, sl st to first pop: 12 pop, separated by 2 ch each. Rnd 3: Sl st in ch-2 sp, ch-2, [pop, ch 2, pop, ch 2] in same ch-2 sp, *[pop, ch 2] in next ch-2 sp, [pop, ch 2, pop, ch 2] in next ch-2 sp, rep from * to last ch-2 sp, [pop, ch 2] in last ch-2 sp, sl st to first pop: 18 pop, separated by 2 ch each. Rnd 4: Sl st in ch-2 sp, ch-2, [pop, ch 2, pop, ch 2] in same ch-2 sp, *[(pop, ch 2) in next ch-2 sp] twice, [pop, ch 2, pop, ch 2] in next ch-2 sp, rep from * to last 2 ch-2 sps, [(pop, ch 2) in next ch-2 sp] twice, sl st to first pop: 24 pop, separated by 2 ch each. Rnd 5: Sl st in ch-2 sp, ch-2, [pop, ch 2, pop, ch 2] in same ch-2 sp, *[(pop, ch 2) in next ch-2 sp] 3 times, [pop, ch 2, pop, ch 2] in next ch-2 sp, rep from * to last 3 ch-2 sps, [(pop, ch 2) in next ch-2 sp] 3 times, sl st to first pop: 30 pop, separated by 2 ch each. Rnd 6: Sl st in ch-2 sp, ch-2, [pop, ch 2] in each ch-2 sp around, sl st to first pop: 30 pop, separated by 2 ch each. Rnds 7-12: Rep rnd 6. Rnd 13: Sl st in ch-2 sp, ch 1 (does not count as a stitch), 3 hdc in same ch-2 sp, 3 hdc in each remaining ch-2 sp around, sl st to first hdc: 90 hdc. Rnd 14: With smaller hook, ch 1 (does not count as a stitch), fpdc around same hdc as joining, [bpdc, fpdc] to last hdc, bpdc around last hdc, sl st to first dc. Rnd 15: Ch 1 (does not count as a stitch), fpdc around same dc as joining, [bpdc, fpdc] to last dc, bpdc around last dc, sl st to first dc, fasten off. 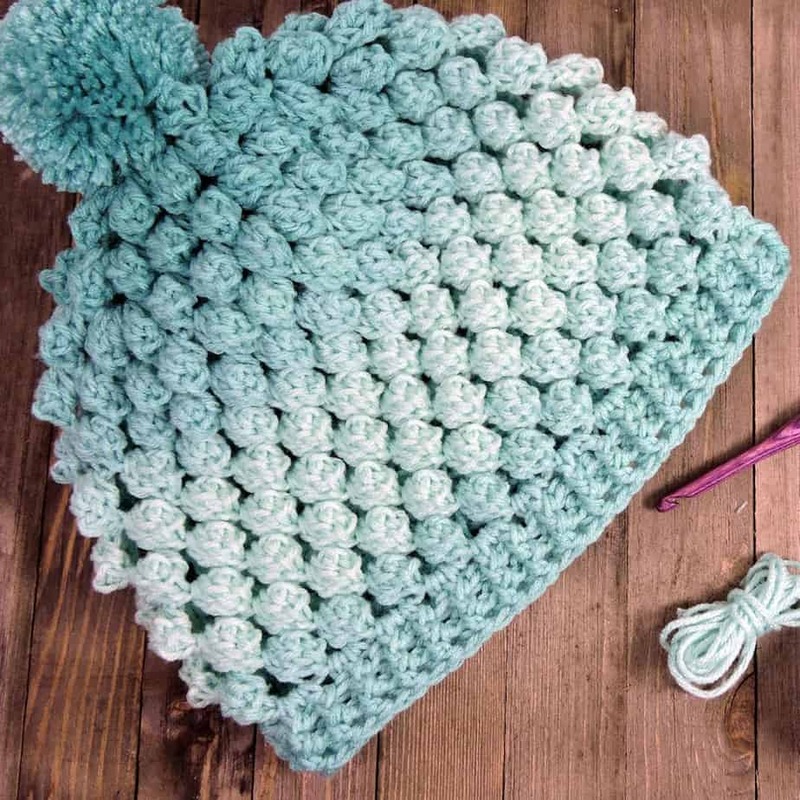 Make a pom pom and attach to top of hat. With yarn needle, weave in all ends securely.